Beautiful Bookcases to Have at Home! My Favorite Beautiful Bookcases and Bookshelves for a Booklover’s Home! There is something almost ‘magical’ about picking a book to read from a beautiful bookshelf! It makes it even more exciting! The most important pieces of furniture in my home are my bookcases! 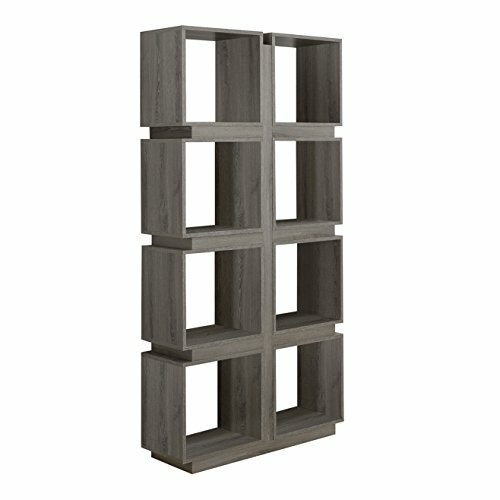 I found some pretty cool, unique and beautiful bookcases for sale online that will look absolutely amazing in any living-room or home office! My favorite ones are the most creative ones, in cool shapes! I also love the bookcase room divider ones! They are perfect to creating two different ‘living spaces’ in one room! 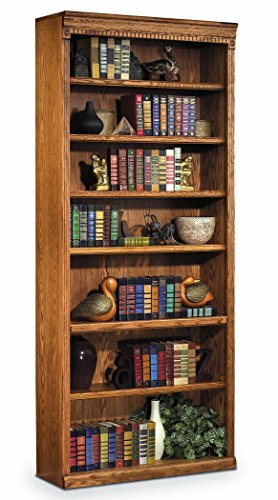 *I love asymmetrical bookcases, just like the one in this picture too! They make any room look very modern and very cool! Ok, enough talking about them! Very Cool and Unique Bookcase with Bins! Who’s up for organizing today with this beyond cool bookcase with bins? How useful is it? You can have it against a wall or use it as a room divider too! It is very sturdy and fairly easy to assemble. The bins can also be removed. You can really get creative with this gorgeous bookcase! This color is always stylish. The bookcase is also solid and will your books pretty well. 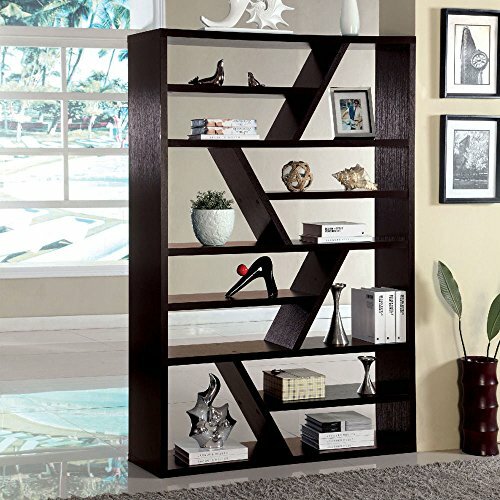 Beautiful and Modern Cubic Style Bookshelf for Your Home! 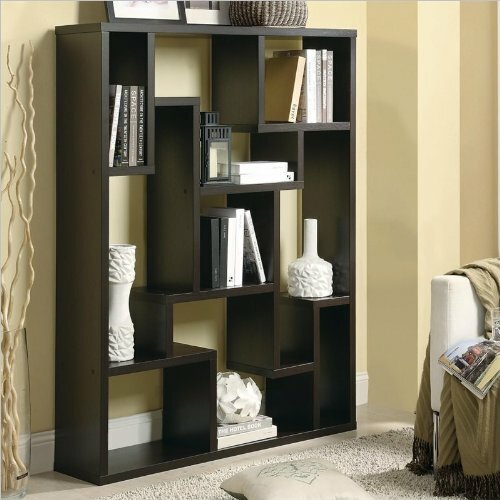 This is a very beautiful and very modern dark-taupe reclaimed look bookshelf that can also be used as a room divider! (For big rooms get two or three and place them next to each other.) I LOVE this idea! Can you imagine how cool it’s going to look? 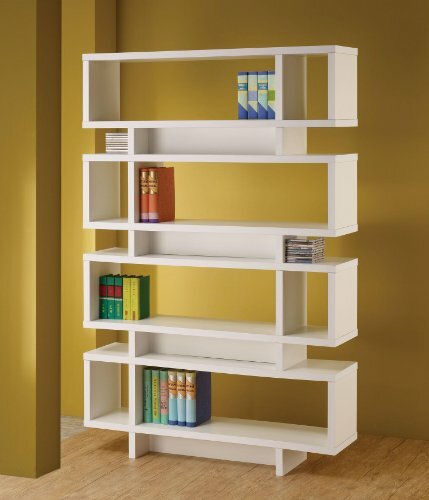 *This is a very cute contemporary style white bookcase for sale! I also LOVE beautiful white bookcases! They look amazing! This is a pretty tall cute white bookcase, at over 72 inches, and it has four tiers! Fun Zigzag Shelf Design Bookcase! 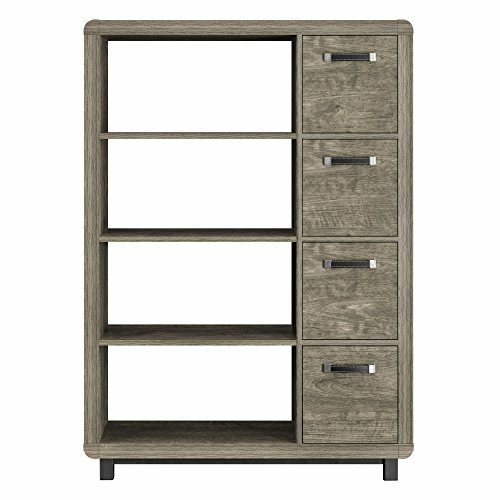 If you are a fan of geometric lines, I believe you are going to love this tall wood espresso bookcase in a fun ‘zigzag’ design! It’s a tall ‘zigzag shelf’ bookcase for sale! My mother-in-law bought two of these for her house and they look amazing! Instead of books she placed all her favorite picture frames in them displaying her whole family, specially her grandchildren… They are very versatile! What a creative way to keep all your books! Every day you can go to a different ‘zig zag’ shelf and choose a different book! If you are looking for the most beautiful and creative bookcases for sale, then I think you are going to like this very cool and definitely very creative rowboat shaped bookcase for sale! It is made from solid wood and it has such a beautiful shiny finish! Perfect to complement any ‘nautical themed’ room decor! It’s pretty tall too! It is 73 inches high. A cool idea is also get some cool LED lights and place them under the shelves to make your unique boat shape bookcase ‘pop’ at night! (I have two of them in my living-room…) If you also decide to get two of them, you can place them side by side, to create an illusion that you have one big bookcase against the wall, just like a library. It is very tall, very sturdy, fits lots and lots of books and other stuff, and it looks gorgeous! I love the burnished oak finish! *It is tall, at 84 inches. Awesome London Telephone Booth Bookcase! 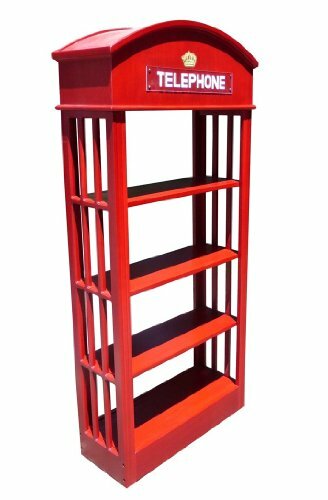 It is a very cool, very creative and very unique red phone booth bookcase! One of the coolest bookcases I’ve seen so far! 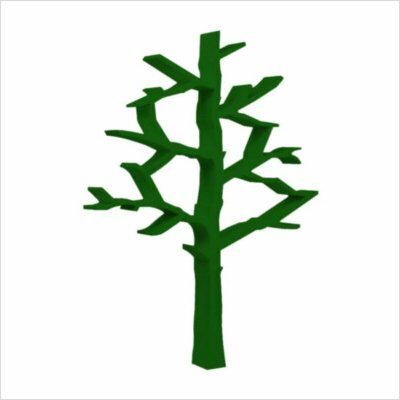 Cute Tree Shape Green Bookcase! And last, but not least, one of most favorite cool shape bookcases for sale! A fun green tree-shaped bookcase! It holds over 100 books on it! Even though they recommend this cute bookcase for a child’s room, I would have it in my living-room, of course! It will definitely stand out against a white wall!